Of course, those are my own opinions, and anything could happen, however, those represent what I think are the pressing issues the markets are dealing with outside of BREXIT at the moment, and since the markets like known vs unknown, should any of these items become known, if even temporarily, the market players will then know where and how to place their bets. However, this does not replace the issues I think we will begin to face later on in 2019 of which I am concerned: the creeping forward of the whole presidential campaigning and the significant rise of volatility, and again, unknowns of politically where we will stand in November of 2020. At this point we are cautiously entering into the equities side now and buying down on positions as well until the conditions warrant another change. 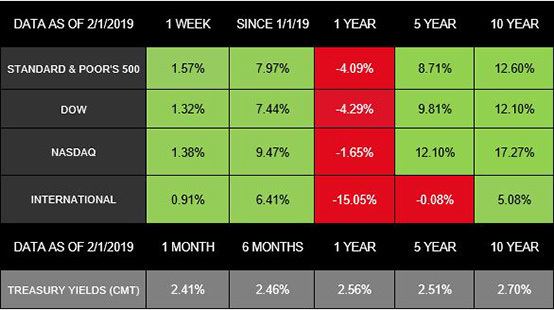 Last week closed out one of stocks' top January performances in years. In fact, both the S&P 500 and Dow posted their best January results in at least 3 decades. For the week, major domestic indexes were also up. The S&P 500 gained 1.57%, the Dow added 1.32%, and the NASDAQ increased 1.38%.The Dow's performance marked its 6th week of gains in a row. Internationally, MSCI EAFE stocks also posted growth, rising 0.91%.